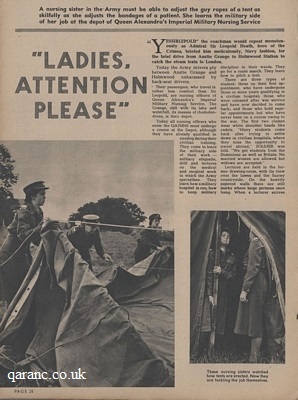 These nursing sisters watched how tents are erected. Now they are tackling the job themselves. 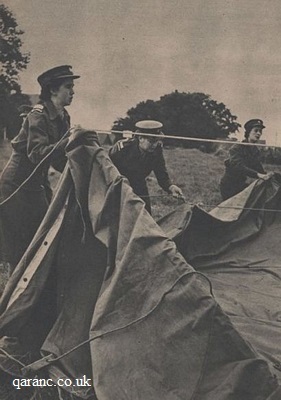 A nursing sister in the Army must be able to adjust the guy ropes of a tent as skilfully as she adjusts the bandages of a patient. 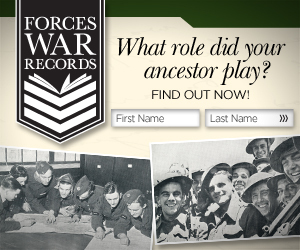 She learns the military side of her job at the depot of Queen Alexandra's Imperial Military Nursing Service. "Yessirlepold" the coachman would repeat monotonously as Admiral Sir Leopold Heath, hero of the Crimea, briefed him meticulously, Navy fashion, for the brief drive from Anstie Grange to Holmwood Station to catch the steam train to London. Today the army drivers ply between Anstie Grange and Holmwood unharassed by back-seat drivers. Their passengers, who travel in rather less comfort than Sir Leopold, are nursing officers of Queen Alexandra's Imperial Military Nursing Service. The Grange, still with its lake and waterfall, its masses of rhododendrons, is their depot. Today all nursing officers who enter the QAIMNS must undergo a course at the Depot, although they have already qualified in nursing during their civilian training. They come to learn the military side of their work - military etiquette, drill and lectures on the medical and surgical work in which the Army specialises. They learn how a military hospital is run, how to keep military discipline in their wards. They go for a route march. They learn how to pitch a tent. There are three types of student: those who have undergone three or more years qualifying in a civilian hospital, those who were released after war service and have now decided to come back; and those who hold regular appointments but who have never been on a course owing to the war. The first two classes wear white shoulder bands like cadets. "Many students come back after trying to settle down in civilian hospitals, where they miss the opportunity to travel abroad," SOLDIER was told. "We get students from the Dominions as well as Britain. No married women are allowed but widows are accepted." Lectures are held in the former drawing-room, with its view over the lawns and the Surry countryside. On the heavily papered walls there are still marks where large pictures once hung. When a lecturer arrives one of the two student orderly officers of the day call, "Ladies attention," and salutes. These lectures come from the RAMC Depot or War Office to instruct in such subjects as man-management, discipline, finance and RAMC history. 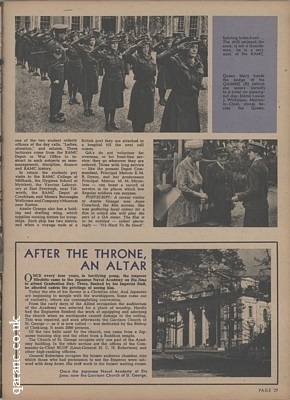 In return the students pay visits to the Royal Army Medical College Millbank, the Hygiene School at Mytchett, the Vaccine Laboratory at East Everleigh, near Tidworth, the RAMC Depot at Crookham, and Messrs Burroughs Wellcome and Company's Museums near Euston. 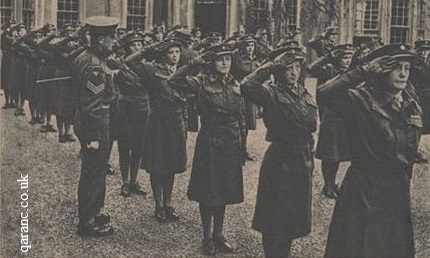 Saluting to the front…The drill serjeant, for once, is not a Guardsman: he is a serjeant of the RAMC. Anstie Grange also has a holding and drafting wing, which supplies nursing sisters for troopships. Each ship has two sisters, and when a voyage ends at a British port, they are attached to a hospital till the next call comes. QA's do not volunteer for overseas, or for front-line service: they go wherever they are ordered. Those with long service - like the present Depot commandant, Principal Matron E.M.B. Dyson, and her predecessor Principal Matron M.M. Mirrieless - can boast a record of service in far places which few Regular soldiers can surpass. 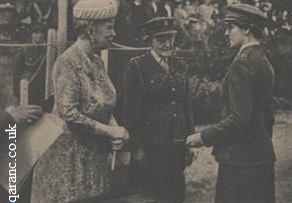 Queen Mary hands the badge of the QAIMNS(R) (which she wears herself) to a sister on passing-out day. Dame Louisa J Wilkinson, Matron-In-Chief, stands beside the Queen. POSTSCRIPT: A recent visitor at Anstie Grange was Anne Crawford, the film actress. She was gathering local colour for a film in which she will play the part of a QA sister. The film is to be entitled - rather alarmingly - "It's Hard To Be Good". See also the QA Centre page.